The European Coatings Show is the gathering of the coatings and paint industry Trends and technologies covering all aspects of the production of paints, varnishes, sealants, building chemicals and adhesives. The exhibition will taking place from 4th to 6th of March 2017 in the city Nuremberg. We are looking forward to your visit in hall 6 at booth 6 - 350. 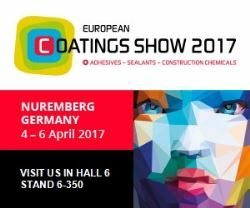 Read more about European Coatings Show.